NT: Nestle-Aland Greek New Testament. OT: Biblia Hebraica Masoretic Hebrew Text, Dead Sea Scrolls, Samaritan Pentateuch, Aquila, Symmachus and Theodotion, Latin Vulgate, Syriac Peshitta, Aramaic Targums, for Psalms Juxta Hebraica of Jerome. The New International Version (NIV) is an English translation of the Protestant Bible. Biblica (formerly the International Bible Society) is the worldwide publisher and copyright holder of the NIV, and licenses commercial rights to Zondervan in the United States and to Hodder & Stoughton in the UK. Originally published in the 1970s, the NIV was updated in 1984 and 2011, and has become one of the most popular and best selling modern translations. A 2014 survey of Americans who read the Bible found that 19% use it. The NIV began in 1956 with the formation of a small committee to study the value of producing a translation in the common language of the American people. The project was formally started after a meeting in 1965 at Trinity Christian College in Palos Heights, Illinois, of the Christian Reformed Church, National Association of Evangelicals, and a group of international scholars. The initial "Committee on Bible Translation" consisted of E. Leslie Carlson, Edmund Clowney, Ralph Earle, Jr., Burton L. Goddard, R. Laird Harris, Earl S. Kalland, Kenneth Kantzer, Robert H. Mounce, Charles F. Pfeiffer, Charles Caldwell Ryrie, Francis R. Steele, John H. Stek, J. C. Wenger, Stephen W. Paine, and Marten Woudstra. The New York Bible Society (now Biblica) was selected to do the translation. The New Testament was released in 1973 and the full Bible in 1978. In 1979 it was decided to produce a version of the New Testament in Spanish with the title La Santa Biblia, Nueva Versión Internacional (often abbreviated NVI) though at this point this version was based only on the former English translation of the historic manuscripts. The English version underwent a minor revision in 1984. In 1990 the committee on Bible translation headed by Drs. René Padilla and Luciano Jaramillo conducted a translation from the historic manuscripts directly into Spanish of both testaments, bypassing English altogether and producing a complete Spanish NVI Bible in 1999. A planned 1997 English edition was discontinued over inclusive language. An 'easy-reader' version, New International Reader's Version (NIrV), was published in 1996; it was written at a third grade reading level. A revised English edition titled Today's New International Version (TNIV) released a New Testament in March 2002, with the complete Bible published February 2005. In 2011, an updated version was released. The update modified and dropped some of the gender-neutral language of the TNIV, along with other changes. Translational issues with Paul's letters were also addressed. Keith Danby, president and chief executive officer of Biblica, speaking of the TNIV, said they had failed to convince people revisions were needed and underestimated readers' loyalty to the 1984 edition. The manuscript base for the Old Testament was the Biblia Hebraica Stuttgartensia Masoretic Hebrew Text. Other ancient texts consulted were the Dead Sea Scrolls, the Samaritan Pentateuch, the Aquila, Symmachus and Theodotion, the Latin Vulgate, the Syriac Peshitta, the Aramaic Targum, and for the Psalms the Juxta Hebraica of Jerome. The manuscript base for the New Testament was the Koine Greek language editions of the United Bible Societies and of Nestle-Aland. The deuterocanonical books are not included in the translation. The core translation group consisted of fifteen Biblical scholars using Hebrew, Aramaic, and Greek texts whose goal was to produce a more modern English language text than the King James Version. The translation took ten years and involved a team of over 100 scholars. from the USA, Canada, the United Kingdom, Australia, New Zealand, and South Africa. The range of those participating included many different denominations such as Anglicans, Assemblies of God, Baptist, Christian Reformed, Lutheran and Presbyterian. The NIV is a balance between word-for-word and thought-for-thought or literal and phrase by phrase translations. Recent archaeological and linguistic discoveries helped in understanding passages that have traditionally been difficult to translate. Familiar spellings of traditional translations were generally retained. In Genesis 2:19 a translation such as the NRSV uses "formed" in a plain past tense "So out of the ground the LORD God formed every animal...". But the NIV imposes a questionable pluperfect "Now the LORD God had formed out of the ground all the wild animals..." to try to make it appear that the animals had already been created. Theologian John Sailhamer states "Not only is such a translation ... hardly possible ... but it misses the very point of the narrative, namely, that the animals were created in response to God's declaration that it was not good that the man should be alone." Biblical scholar Bruce M. Metzger criticized the addition of just into Jeremiah 7:22 so the verse becomes "For when I brought your forefathers/ancestors out of Egypt and spoke to them, I did not just give them commands about burnt offerings and sacrifices." Metzger also criticized the addition of your into Matthew 13:32, so it becomes "Though it (the mustard seed) is the smallest of all your seeds." The usage of your has been removed in the 2011 revision. According to the Christian Business Association, the New International Version has become the most popular selling English translation of the Bible, having sold more than 450 million copies worldwide. There are numerous study Bibles available with extensive notes on the text and background information to make the Biblical stories more comprehensible. Among these are the NIV Spirit of the Reformation Study Bible, Concordia Study Bible, the Zondervan published NIV Study Bible, the Wesleyan revision, Reflecting God Study Bible, as well as the Life Application Study Bible. In 2009, N. T. Wright wrote that the 1980 NIV obscured what Paul the Apostle was saying, making sure that Paul's words conformed to Protestant and Evangelical tradition. Wright believes that due to paraphrasing and interpretation, Protestants and Evangelicals will never understand what Paul was talking about if they rely on the NIV. According to Wright, this happens in several of Paul's letters: Galatians and Romans. Professor of New Testament Studies Daniel B. Wallace has praised the 2011 update, stating: "it is a well-thought out translation, with checks and balances through rigorous testing, overlapping committees to ensure consistency and accuracy". The Southern Baptist Convention rejected the 2011 update because of gender-neutral language, even though it dropped the gender-neutral language of previous versions. Southern Baptist publisher LifeWay declined the SBC's censor request to remove the NIV from their stores. While the Lutheran Church–Missouri Synod cautioned against its use, the Wisconsin Evangelical Lutheran Synod stated many decisions are right and defensible, and will use it in their new hymnal. ↑ "The New International Reader's Version: What, Who, and Why". International Society of Bible Collectors. Retrieved 2014-09-14. ↑ "New International Version :: Official Site". Retrieved 2014-09-14. ↑ "Biblegateway About The NIV, Version Information". Retrieved 2014-09-14. ↑ Ronald F. Youngblood; Glen G. Scorgie; Mark L. Strauss; Steven M. Voth, eds. (2003). The Challenge of Bible Translation: Communicating God's Word to the World. Zondervan. pp. 236–245. ISBN 0310246857. Retrieved 2014-09-13. ↑ "Nueva Versión Internacional - Version Information - BibleGateway.com". 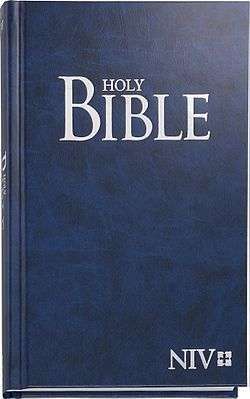 1 2 "Update of popular 'NIV' Bible due in 2011". USA TODAY. 2009-09-01. Retrieved 2011-09-20. 1 2 Smietana, Bob. "New Bible drops gender-neutral language of '05 version". About USATODAY.com. USA TODAY, a division of Gannett Co. Inc. Retrieved 2015-07-30. But they also made changes — like going back to using words like "mankind" and "man" instead of "human beings" and "people" — in order to appease critics. ↑ "Updated NIV Text Available for Online Viewing November 1". Zondervan. Retrieved 2011-02-09. ↑ Irwin, Ben (2002). History of the English Bible. Zondervan. p. 61. ↑ Barker, Kenneth L. (1991). The NIV The Making of a Contemporary Translation. International Bible Society. p. 54. ↑ "History of the New International Version". About.com. Retrieved 2011-02-09. ↑ Irwin, Ben (2002). History of the English Bible. Zondervan. p. 60. ↑ "Bible Translation Chart" (PDF). Retrieved 2011-02-09. ↑ Mariottini, Claude F. (2013). Rereading the Biblical Text: Searching for Meaning and Understanding. Wipf and Stock. ISBN 978-1620328279. ↑ Sailhamer, John H. The Expositor's Bible Commentary. Zondervan. ISBN 978-0310364405. 1 2 Metzger, Bruce M. (2001). The Bible in Translation : Ancient and English Versions. Grand Rapids, MI: Baker Academic. p. 140. ISBN 978-0-8010-2282-1. Retrieved July 30, 2011. ↑ Menzie, Nicola (27 March 2013). "NIV remains the bestselling Bible translation". Christian Today. Retrieved 16 April 2013. ↑ Wright, N. T. (2009). Justification : God's Plan and Paul's Vision. Downers Grove, Ill.: IVP Academic. pp. 51–52. ISBN 978-0-8308-3863-9. Retrieved March 15, 2015. ↑ "DTS faculty". Retrieved 22 September 2011. ↑ Wallace, Dan. "A Review of the New International Version 2011". Retrieved 22 September 2011. ↑ Stephanie Samuel. "LifeWay Tells Critics of 2011 NIV Bible: 'Trust the Trustees'". Retrieved 2015-07-30. ↑ Marty King. "LifeWay to continue selling NIV; trustees select new leadership". Retrieved 2014-04-21. ↑ Audrey Barrick. "Lutherans Latest to Reject New NIV Bible Over Gender Language". Retrieved 2012-09-05. ↑ Kenneth A. Cherney, Jr. "Gender-Neutral Language, with Special Reference to NIV 2011" (PDF). Retrieved 2015-06-17. ↑ Director Michael D. Schultz. "Work Taking Place On The Next WELS Hymnal" (PDF). Retrieved 2015-06-17.